Since 1985, bus speeds across Los Angeles County have dropped 10 percent due to increasing traffic. As a result Metro and other stakeholders — including both the city and county of Los Angeles — have formed a group called the Los Angeles County Bus Speed and Street Design Improvement Plan. Its acronym: CBSIP because, you know, it’s government and all group names have to be long with acronyms. That issue aside, I wanted to point readers to a progress report by the CBSIP that is on the Board of Directors’ planning committee agenda today. There’s nothing in the report that is likely to rock your world. But it does offer insight into how the group is going about its business of figuring out the best place to try to improve bus speeds and at what cost. The report also recommends going forward with a more detailed look at what can be done to speed up busses on Santa Monica Boulevard, Vermont Avenue and 3rd Street. If you have any ideas for these streets or any others, toss them on the comments board, please. There needs to be a real cost-benefit analysis on bus lanes. On corridors like Vermont and Santa Monica, it is likely that the already packed Rapid buses move more people than a car lane during rush hour. With a bus lane, the faster travel times and increased frequencies (due to greater fleet flexibility) will attract discretionary riders. It’s time to take Rapid seriously and start real BRT on the street grid–the single most cost-effective transportation strategy. Don’t get me started on TAP, but a true, functioning smart card system will reduce dwell time at every stop along the route. Advance payment with level boarding reduces dwell time even more. These aren’t new ideas and they’re a whole lot cheaper than any of the 30/10 projects. Eric: excellent point about dwell time. I was in San Francisco recently, hopped on a bus and paid the $2 cash fare and could just feel the eyes of everyone on the bus looking at me — tourist without a pass slowing things down! Anything to speed up boarding would speed up everyone’s bus trip, too. 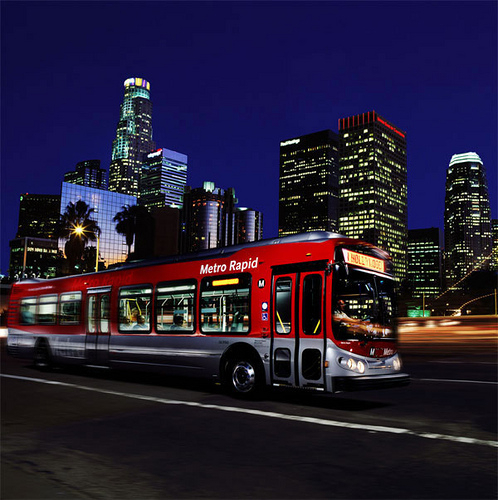 Some of the few mass transit lines that Metro turns a profit on, after capital expenditures and operating costs, would have to include Vermont Ave, Santa Monica Blvd and Wilshire Blvd rapid bus lines. If this was a private company these would be towards the top of the list for capital expenditure increases to improve service for more profits. This would include off-board payment machines, more extensive and elaborate bus shelters with at least twice weekly cleaning (as is done on the Orange Line.) Also, perhaps on-board bicycle racks at the back door entrance or three bike racks at the front to accomadate more bikes and faster loading. Why is it the bus lines that make a profit for Metro are delegated to second or third class treatment compared to rail or even the Orange Line BRT? It’s shameful to see how the passengers on the busy Van Nuys lines have to sit on top of shopping carts or out in the rain leaning against a building waiting for the bus. Or how the bus has to stop for several minutes in order to load all the passengers one at a time through the front door at the Lankershim Blvd bus stop or on Vermont Ave. I took the Vermont Ave at around 3 PM about two months ago and at one stop the driver simply opened up all three doors to let in the crowd of passengers. Profit making customers for a company should simply not be treated this way. I think Vermont Ave is a great street to begin experimenting with converting major arterials to one-way streets with dual bus and bike lanes. One-way streets are in LA’s future, they might as well as start planning and getting drivers used to them now. Eliminate street parking. Create a bus only lane and get rid of ER reports. There is no need for street parking. Businesses will do fine without it.